These reviews share everything you’ll need to know about HelloFresh – one of our favorite meal delivery services. You’ll find the unboxing and cooking process of meals, plan options and prices, comparable subscriptions, how we rate this box, and all the other little details in-between. Interested in other options? Our list of food subscription boxes shares many more of the top companies – including options for snacks, smoothies, candy, and so on. HelloFresh recently caught my eye with their promise of fresh, ready-to-cook meals delivered to your doorstep every week. I recently tried out another meal delivery service, and I loved the convenience, so I figured I’d take advantage of all the great intro deals by subscribing to HelloFresh and a couple more similar subscriptions. My future HelloFresh reviews will provide detailed insight into the ingredients I received, whether the recipes are simple to follow, and the overall quality of the meals. This first article will be an introduction to their offer. I will explain how the service works, how to benefit from deals, and much more! The HelloFresh website is neatly organized and easy to navigate. Their homepage outlines how their service works, what comes inside weekly boxes, some examples of recipes, and snippets from their Instagram. Praised in many HelloFresh reviews, they have a few tabs at the top that provide their menus and additional information you should be aware of. You can also find details about their wine club and gift subscriptions. At the bottom, they provide links to their social media accounts and their blog. You can also find their help pages here, along with their contact information. Finally, there is also a HelloFresh app to make it more convenient to edit your order preferences, skip a delivery, or anything else. 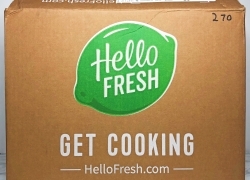 HelloFresh delivers their shipments in 100% recyclable, refrigerated boxes. The boxes have insulating liners, ice packs, and cooling material to keep the food as cold as possible. They even state that they modify the packaging based on the season. Plus, if any of the ingredients you receive are spoiled, you can contact their customer service team to resolve the problem. After you choose which plan you want to subscribe to, you’ll create your HelloFresh login information and proceed to checkout. Here, you’ll fill out your shipping and payment information. You can also choose which day you prefer to have it delivered. You’ll be able to view and select your meals only after you’re done with the aforementioned process. HelloFresh offers a pretty good variety of weekly recipes. They provide nine recipes for the classic plan, three recipes for the veggie plan, and five recipes in the family menu. For example, some of the HelloFresh meals this week for the veggie plan are loaded quinoa bowls and yellow squash flatbreads. You can mix and match recipes from different plans as much as you’d like, and you will be able to see meal options for a few weeks ahead. One note I thought I should mention in this HelloFresh review is that it would be great if they offered more dietary preference options, such as gluten-free, vegan, and so on. If you’re looking for a meal kit that does so, Sun Basket would be a better option to try out. While it is a little pricier, this services offers a vast variety of dietary preferences. I will also compare similar subscription boxes in a few paragraphs below. The prices for HelloFresh depend on how many meals you get per week and how many people you’re cooking for. You can choose between a two-person plan or four-person plan. There’s also a family plan with special, discounted recipes. Hello Fresh reviews on Yelp suggest that the amount of food you get with a two-person plan is enough to feed three people. The prices for meal delivery services are a little spendy in my opinion. However, this subscription is on the cheaper end, and also offers a few good deals you can take advantage of. For example, I was able to find a HelloFresh coupon for 50% off my first shipment plus free shipping, which is a fantastic deal. This reduced the price for my first box to just $29.94! This deal can be applied to any plan, and there is no promo code you need to provide. I found it by searching the web for HelloFresh deals. They have an ad at the top of the results that leads straight to this deal. 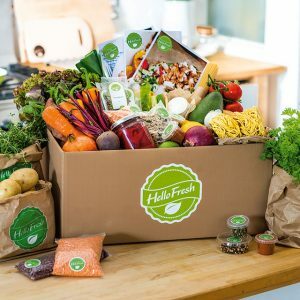 In addition to HelloFresh, there is a growing number of other food subscription boxes to choose from. A few other meal delivery services I’ve subscribed to are Sun Basket, Blue Apron, and Home Chef. If you’re not particularly looking for meal kits, there’s a variety of snack boxes as well that I’d recommend trying. Urthbox and Degustabox are a couple of these that I’ve enjoyed. As for boxes similar to HelloFresh, I’d say Blue Apron is one of the most similar options. They’re very comparable in price, plan offerings, and meal options. You might want to check out my Blue Apron reviews so you can compare the two more easily. This goes for Home Chef reviews as well!